If you find your current 4GB Memory Stick is insufficient to store your video or image files, now you can try the Sony newest Memory Stick – the 8GB Memory Stick Pro Duo. This latest memory stick has double the capacity of Sony’s previous memory stick and it can store up to 3,000 digital photos with 10-Megapixel resolution, or 4,100 songs in Atrac format, or 2,000 MP3 songs with an average length of 4 minutes, or 19 hours and 20 minutes of QVGA video in MPEG format. The 8GB Memory Stick Pro Duo comes complete with a standard size Memory Stick adaptor. This small-sized flash memory stick weighs merely 2g, and measures 0.79-inches wide and 1.22-inches long. 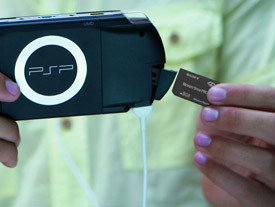 Sony has given a 5-year warranty to users to ensure the stability of the product. Furthermore, a rescue software is also available for users to download free from Sony (www.sonydigital-link.com/memstick/). This software will enable users to quickly recover photographs or other files that may have been lost or accidentally deleted. This new 8GB Memory Stick Pro Duo is undoubtedly a brilliant invention that meets the most demanding of customers’ needs. It can certainly reduce storage problems significantly. Having said that, users need to be aware that this new memory stick is only compatible with the latest Sony products. Make sure this device is working before you delete and clean off your old memory stick. This memory stick works well with Sony products such as Sony mylo personal communicator, Sony Ericsson mobile phones, the new PlayStation3 videogame console and all Cyber-Shot digital still cameras.